KAESERAQUAMET Oil Water Separator Clean waste water – without the fuss.All compressor condensate usually contains trace amounts of oil. Accordingly, it's common in most cases forofficial regulationto apply which requirecompliance with a maximum oil contentbefore condensate. KAESER AQUAMAT Oil Water Separator remove dispersed oil – with type approval from Deutsche Institute fur Bautechnik (DIBt). They enable legally compliant treatment of condensate – directly where it arises and with no energy consumption. We offer electronic level sensors, tested oil pans and frost protection heaters To meet specialized installation requirements. Special condensate distributors are available for a parallel hook up multiple separators with condensate load which is equivalent. Having your condensate picked up and treated externally by specialists is expensive. With AQUAMAT, only residual quantities of toxins remain for disposal – cutting typical disposal costs by some 90 %. All CF models use powerful synthetic fiber filters with enhanced filtration capacity (not activated carbon). 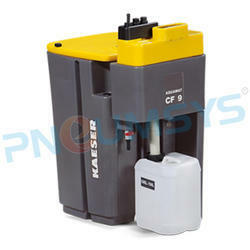 Models CF9 and higher feature a settling chamber upstream of the filters in which floating oil is drawn off into an external collection container by an overflow. This reduces load on the filter and also extends the service interval. You can visually check the quality of the purified waste water using a reference turbidity set. The models with a main filter cartridge are especially user-friendly as they can be pulled out using handles and fixed in place to drip dry – clean and straightforward.